New ChangeLab Report: The Importance of Asian Americans? We know two things for a fact: Asian Americans are the fastest growing racial group in the United States, and we overwhelmingly voted in support of Obama in 2012. But do either of these things signal progress for the racial justice movement? The fact is that the racial justice movement needs a serious upgrade. Diversity and multiculturalism do not equal justice. How do we avoid mistaking growing numbers for real political vision? 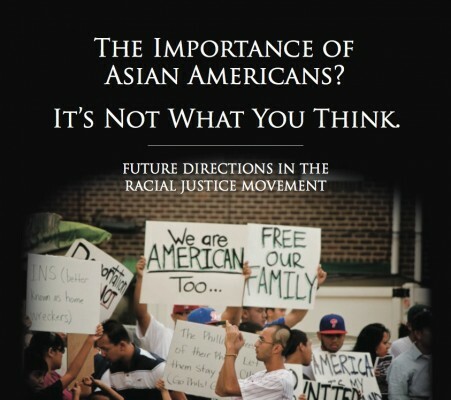 Our new report, The Importance of Asian Americans? It’s Not What You Think, offers insight into the challenges we face today. It also explains why Asian Americans have a critical role to play, if we can get our house in order. Soya Jung, author of the new report, identifies the crux of the challenge for Asian Americans in racial justice work: “The problem is not just in the exclusion of Asian Americans from racial justice spaces, but also in the self-distancing of Asian Americans from racial justice framing.” Despite this, she contends that Asian Americans have important contributions to make in racial justice work: “The importance of being Asian American lies not in our ability to lift ourselves up above others, but in our potential to shine a bright light on the brutality of U.S. war and imperialism.” She argues that the connection between race and American Empire that the Asian American movement saw so clearly in the 1960s is more entrenched today than ever before. To find out more, download a copy of our new report today! And let us know what you think. Copyright © 2019 ChangeLab and its authors.